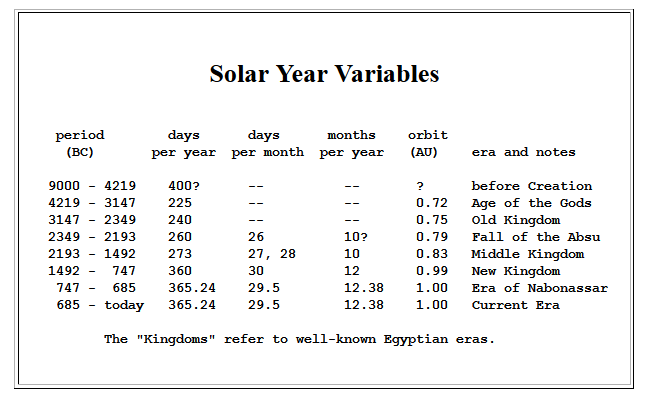 Earth's variable Solar year, as calculated by Cook, Appendix A. Each time the Earth reached a different location from the Sun, it needed to adjust its charge level, and plumes of plasma extended up from the magnetic poles, lasting years. Perihelion and Aphelion of Earth in antiquity, as calculated by Cook. Within fifty years of c. -3147, the Egyptians start an annual record of Gods or God-pharaohs. The calendar is annual, and years are named after religious festivals or other accomplishments. The years are without notation of seasons or months (there was no Moon orbiting Earth as yet). The Mesoamerican predecessors of the Maya were counting in Tuns ("stones"), which are years, and in Katuns, which are twenty-year periods, and soon in a larger measure of 400 Tuns, known (to us) as a Baktun. Certainly a record of years was kept, likely in terms of the larger blocks of 20 years and 400 years -- for in the 16th century AD the Maya 'Chilam Balam' will be able to correctly specify the Katun of all celestial events since c. -3147 that we know of from the eastern Mediterranean myth-histories.